Are you sure you want to remove Oedipus from your list? Oedipus: A tragedy. As it is acted at the Theatres-Royal in Drury-Lane and Covent-Garden. 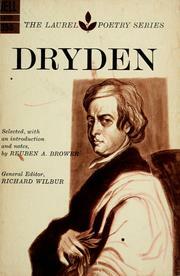 Written by Dryden and Lee. 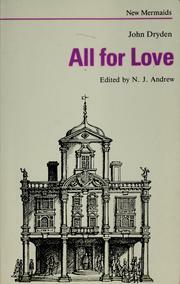 in English - Bell's ed. Oedipus: A tragedy. By Mr Dryden and Mr Lee. Oedipus. : A tragedy. By Mr Dryden and Mr Lee. Oedipus: a tragedy. Written by Mr. Lee and Mr. Dryden. Oedipus: A tragedy. 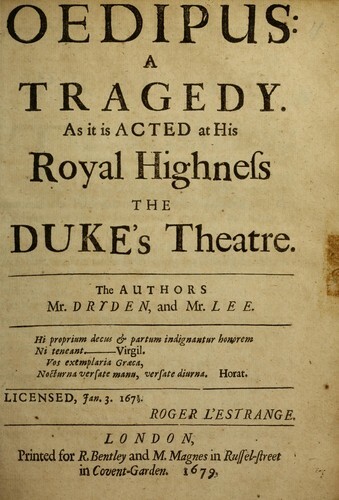 As it is acted at His Highness the Duke of York's Theater. Written by Mr. Dryden and Mr. Lee. Oedipus: a tragedy. Written by Mr. Dryden and Mr. Lee. Oedipus: a tragedy. By Mr. Dryden & Mr. Lee. Oedipus: a tragedy as it is acted at His Royal Highness the Duke's Theatre. 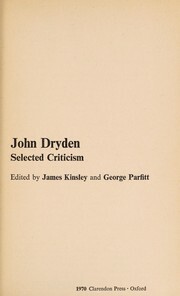 The authors Mr. Dryden, and Mr. Lee. Oedipus: a tragedy. 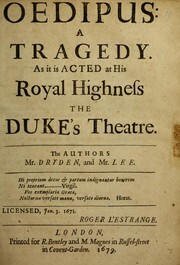 As it is acted at His Royal Highness the Duke's Theatre. 1692, Printed for Richard Bentley in Russell-Street in Covent-Garden. Oedipus: a tragedy : as it is acted at His Royal Highness the Duke's Theatre. 1679, Printed for R. Bentley and M. Magnes in Russel-street in Covent-Garden.